Maths Workbook | Maths Workbook for Children for easy aquisition of minimum levels of Academic Standards | Practice Work Book for Remedial teaching Maths from Classes III to IXI. 3RS Programme implementation | Guide for English. English Teachers in Primary Upper Primary and High Schools have to conduct 3RS Prograame as per the orders of School Education Department. 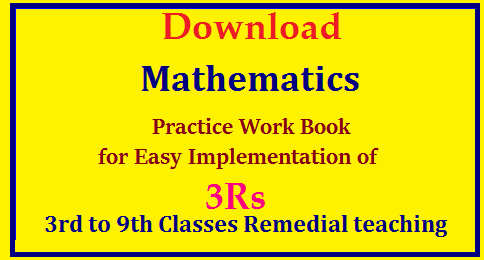 This is the Good Practice Work Book for Best Practices in 3RS for English Subject from Classes 3 to 9th.mathematics-3rd-9th-practice-work-books-for-3rs-programme-download-remedial-teaching. This Work is useful as it contains problems involving additions, subtractions, multiplications and divsion problems including verbal problems..the high school work book contains all the problems which help the students to achieve minimum academic standars and also to know arithmetic properly. Teachers can utilise this practice work book as Teachers Hand Book for Refference to give Home work to the children from 3rd to 9th classes.